When you’re in for a long car drive, coffee alone won’t keep you safe when you start nodding off. Here’s how to stay wide-eyed even when the road before you seems endless. 1. Stock up on caffeine. Once that first cup of coffee is gone, you may not pass a gas station to fill up on java again, at least not for miles. Pack iced coffee or tea, a 5-hour ENERGY drink, chocolate, or NoDoz pills to wake you up. 2. When you have a road trip buddy along for the ride, you can share the driving responsibilities of your cheap car rental and rest up during your downtime. When it’s your turn to get behind the wheel, ask your pal to read to you or find fast-paced songs on your MP3 player to keep you alert. 3. Sugar-packed treats taste delicious and seem like they’d give you a much-needed energy boost, but they’ll also make you crash soon after. Instead, bring along plenty of healthy snacks. The energy will be distributed at a more even pace and you’ll avoid that food coma. 4. If the weather’s chilly outside, resist the urge to blast the heat in your car. Colder temperatures are better for staying alert. Turn the temp down a few degrees below your comfortable temperature so that it’s cool without being unbearable. Another way you can make your drive more satisfying? Stock up on car rental coupons to score a great deal! 5. 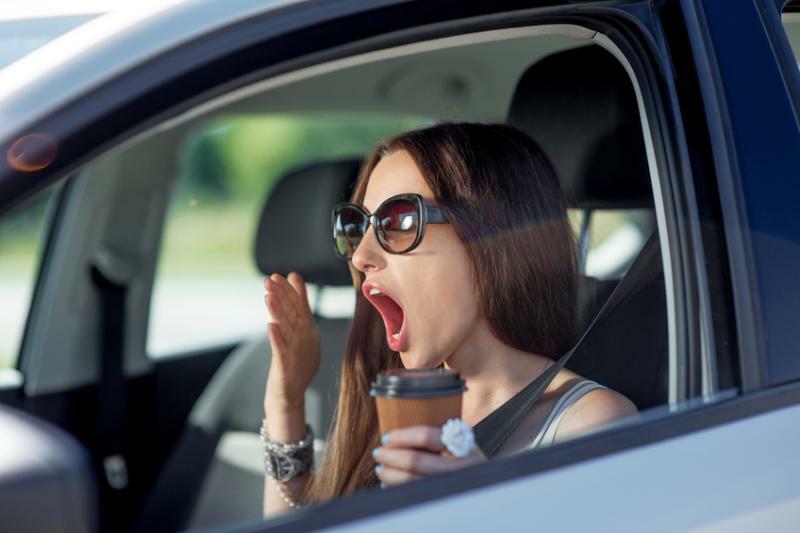 Facial exercises may look odd to your passenger or the person in the next lane, but they’ll keep you wide awake, so they’re worth the embarrassment. A few easy exercises include sucking in your cheeks, opening your mouth wide and then pursing your lips, or opening your eyes wide and then raising your eyebrows. 6. If you suffer from serious weariness on the road, ask for a car rental deal that comes with a lane departure warning system. When your vehicle drifts out of your lane without the turn signal indicator on, you’ll get a warning that will jolt you into awareness. Is nothing working? Pull over to the side of the road and take a break. You may get to your destination later than expected, but nothing is worth the risk of driving when you’re too tired to stay awake.